Alexis is for when you want to go big. With 5 stems of gorgeous and incredibly fragrant pink and white Oriental Lilies, each with at least 1-2 large and impressive blooming heads, this very large bouquet is certain to overwhelm your special someone.Lilies may be sent some closed/partially closed in order to prevent damage and to last longer.Our bouquets do not include a vase. However, for a bigger impression we recommend a Superior vase, which is an ideal selection for this gift. Perfect arrangement of the most beautiful oriental Lillies. Great delivery also and easy to order online. Thank you. 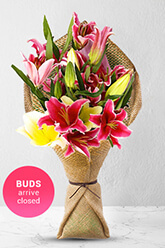 Ordering process was easy and flowers delivered were as per the photo and received many compliments . Very Easy and convenient to organise, beautiful and well priced with discount. They were very well received and looked beautiful. Loved the reminder, soooooo easy to re order and the arrangement was stunning! THANKYOU!!!!! Wow ingenious re-order set up. I would not have ordered due to lack of time but you have made it so easy!!!?? Arrived on time, the recipients were delighted with the flower arrangement.